I’ve raved about any number of Glenn Hughes shows over the last decade and a half. With one exception (that strange party one-off at the Astoria 2 ) they’ve been varied, always exciting and individual. And if I had to choose between, say, his last gig at Sheffield Leadmill and BCC at the Academy the other day, I’d opt for the former no question. On the other hand I can quite see why BCC are working it for all they’re worth, and if it takes Glenn up from playing places like Bradford Rios to more prestigious gigs, and gets albums in the rock charts (I saw one young lad leaving show with a shrink-rapped vinyl copy of BCC2 from the merch stall which was nice), then arguably it’s worth a gamble. I’ve been using The Academy since it was first built, and seen a good number of bands there, but this was certainly one of the oldest audiences I have ever been amongst there (it does make a bit of a change not to be the oldest person at a gig by a long shot!). Clearly BCC are giving us all something which resonates. Proper rock music for one thing. Yet I must confess we almost didn’t go. £40+ for tickets, plus travel, is a lot in these recession hit times, especially for a new band. We’d opted for a cheap Saturday night DVD and staying in, when I got the offer of the guest list. Ann stuck with the DVD (to be fair we had done a 3 hour walk in the Peak District that morning on what was one of the hottest days of the year), so me, my brother and his lad, a drummer keen to see one of the Bonham’s live, hit the Snake Pass. Michael Schenker were on first. And on early. So as we’d had to sample one of the nearby restaurants on the famous curry mile, we actually missed the start of their set. I was impressed at the number of UFO fans there as we walked in, and the group were rattling through some UFO oldies which I actually knew. While it was a bit of a shock to see how Michael looks (having not seen him since his black leather UFO days in the Free Trade Hall down the road some 30+ years ago), it was reassuring to have him back on form. Indeed from where we were for a while it looked as if the promoters might have goofed and put the headliners on first, but the crowd didn’t thin out much between sets and were already hyped up when the lights dimmed and a trebley version of Ride of The Valkyries came out of the PA. It sounded like they’d just downloaded a cheap MP3 and were playing through an iPod. Mercifully this, and the rather lacklustre light projections, were the only embarrassing moments of the show. As soon as they came on it was all off and running big time. A couple of shorter tracks, then quickly into the longer material as they began stretching out as bands used to do on stage in the 70s. Indeed we were very surprised Jason wasn’t allowed to do a drum solo, it certainly would have gone down well. Sadly the keyboard player was given the spotlight, and must have hit the Tony Carey Emulator button on his Korg, rather than grind out some low-end Hammond which is what was called for. That aside for the most part the band clicked into gear effortlessly, and the riffs were near perfect throughout, with that enormous drive only musicians of this calibre can deliver. It was let down a little by the sound balance which saw JB’s guitar and vox note perfect in the mix, but left the bass a little muddy (is it one of those fake aged models or genuine road wear? I couldn’t tell from where we were) and JB2’s drum sound a bit buried. 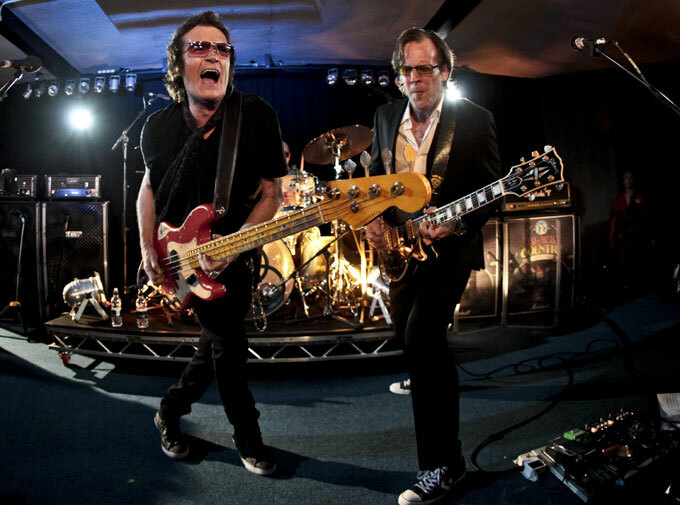 As the show progressed it did feel at times more like ‘Bonamassa – now with added Glenn Hughes’. The longest track of the night was one of Joe’s solo tracks and it actually delivered a lot (even though it wasn’t one I knew), so I kind of had the concern that while the partnership between the four is properly balanced on record (poor production aside), on stage it seemed a bit skewed. It is early days though, and in any case most of the crowd seemed well up for things as they were. Indeed it was almost as if the last 35 years hadn’t happened, with people just waiting for an opportunity for some grown up no-nonsense rock music. But for me the niggle remains that if Bonamassa (and his traveling guitar shop – have you ever seen anything so elaborate or slick?!) decides something isn’t working for him, then BCC could easily flounder. On the other hand, as a group they have already achieved an awful lot in a very short space of time (with a live DVD to be filmed any time now). So if it gives Glenn an opportunity to up his game then it’s probably a gamble worth taking. What would be great is for BCC to develop to the point where if it doesn’t carry on, Glenn will have had that extra push to enable him to straightaway bring in audiences for his solo material on a similar level. Talking of Glenn, he appeared to be relishing the experience – putting on a good front man show, even if sounding a tiny bit stretched at the end of what has been a demanding opening tour. So it will be fascinating to see how the group progress. Manchester loved them, and as Jason came from behind the kit to link arms with the others and start a chant of BCC, it was clear this is something which will become a feature of future shows. Thanks to Drew and Carl for getting me in. Simon travelled via the A57 and ate at the Sheer Khan curry house, all expenses paid by his younger brother (in lieu of petrol money). He manfully resisted Abdul’s kebab house after the show but did give-in to the temptations of the ice-cream fridge in the late night grocery. He also wondered what the guy in the Bauhaus t-shirt made of it all.